Ah, Butterflies, my very highly imitated (down to my color scheme and font, really folks? ), is back by popular demand. You asked for "Todays Inspiration" back - you GOT it. I think I mostly got tired of the second rate imitations of this column and thought I should get back to doing what I do best, INSPIRE. Not sure if it will be totally daily again with inspirational posts or if it will be a strictly Motivation Monday deal until I get my 'groove back', but I know you wanted this feature and our monthly handbag in the spotlight back and I thought I'd get started on resuscitating this feature FIRST, and yes I am working on bringing the Monthly Featured Handbag in the Spotlight back for Fall so please stay tuned. For Today's Inspiration I am joining the ranks of the 'consciously un-coupled', perhaps Gwenyth Paltrow's speech at the BlogHer15 Conference (are we still calling this a conference, or should we call it a phenomenon unto itself which it always is) is still playing in my head, but this conscious un-coupling thing is making the rounds. It's even taken Gwen Stefani and Gavin Rossdale, Ben Affleck and Jennifer Garner (perhaps there was a reason for her never switching to Jennifer Affleck, smart!) and now even Kermit and Miss Piggy are 'un-coupling'. However in my case it's a MINDSET I want to 'consciously un-couple' with. Just like we can outgrow a lover or any type of relationship to be frank, we can outgrow a mindset that sneakily permeates itself into our core and slowly and subtly makes us think of ourselves in ways that no longer serve a higher purpose in our life. Remember when I told you that at Getting Gorgeous there was both a Psychic Reading a 'Face Reader'? (refresh your memory HERE) I had mentioned I wanted to re-visit the Face Reading a bit in another post, here it is. Something entirely dis-concerting happened which I left out of the Getting Gorgeous recap as it was certainly more fodder for this column than it was for an event recap! For some reason she kept emphasizing that she saw that I was 'quite well off'. She literally peppered this into the conversation at least a dozen times. Mentally I found myself screaming 'what the hell are you talking about? I am FAR from well off Lady!' - this must surely be FAKE. Then I thought maybe I was being punked. At no point did she ask me my name, not my first or my last so this couldn't be some typical association with my last name being Iglesias and the singer Julio that I have had to dodge my whole life right? For the record, as far as I know I am NOT directly related to singer Julio Iglesias. I wanted to find every reason to interrupt her, to interrupt the session or at least ask her how the heck did she figure me to be 'well-off''? But somehow I didn't. Something kept stopping me. I thought if I listened on and didn't interrupt her train of though, somehow she would get to the HOW I get to this 'well-off' life that she perceived me to have. My face got 'read' and I wouldn't be surprised if it got 'red' too. She revealed quite a bit about me that she had no way of guessing. I was surprised that face reading can tell you so much. But if people can read our 'palms' can it be that far off for them to read our faces as well? If you are thinking 'Butterfly what on earth does this have to do with you consciously un-coupling? I realized during my Face Reading that somehow it felt like an affront to my person to be accused of being wealthy. I am NOT even sure why that is. I made the decision that night as the days events played in my head that I MUST for my own good, consciously un-couple with thoughts of 'lack' in all its forms. Those thoughts obviously clawed into my brain and dug root there somehow. Maybe it's living in the city that never sleeps where everyone's 'hustle' has to have a 'side-hustle' to survive. But a 'make ends meet' and not look much beyond that mentality somehow took root in my soul and I have consciously decided to un-couple with it. WILL YOU JOIN ME? Will you release lack and affirm prosperity into YOUR life? What mindset do YOU wish to 'consciously un-couple' with? FTC Disclosure: This is NOT a sponsored post, NO monetary compensation has been received, and ALL opinions are 100% my own! I am disclosing this in accordance with the Federal Trade Commission 16 CFR, Part 255 - Guides Concerning the use of endorsements and testimonials in advertising, you may check our Giveaway and Disclosure Page for additional information regarding Ascending Butterfly Disclosure. Like most people, we live paycheck to paycheck, but we are happy and that's what really counts. Would more money make us happier, maybe, but right now, I wouldn't change a thing. I would want to un-couple with worry in my life. It even bothers me in my sleep. I know this is not good. I know I should learn to trust in God's Wisdom. Money is defiantly not the way to happiness. Look at those that do have money in Hollywood. Yes more money would be nice, but it only magnifies your personality. If you were mean before this would make it worse. For me I would love to earn a little more money, but more to help others and travel. 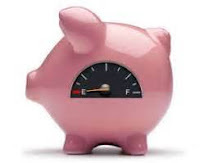 I really do believe we are very well-off, in spite of the fact that we need to pinch pennies and spend very carefully. Truth is, we have far more than much of the world, and by those standards we are rich! When I first started blogging, it was just as a hobby. I had no idea I could make money at it. However, I want to be clear here and say that I am by no means "well off" either. It is a daily struggle to pay the bills. But, I would not change the fact that I became a blogger for anything. I love it and I will continue to do so. I think it's great that you're getting back to what makes you happy. I look forward to more inspirational posts. We are lucky enough to not be living paycheck to paycheck anymore. It's good to not be caught in that cycle. I know money can make or brake a couple. Everyone view money differently. But if you are in a marriage or relationship, you must be on the same page if you want to be happy and healthy. Money is a dragon that always follows me ; Still I wouldn't change a thing my family is healthy and my friends are a blessing ! I wont lie extra money would make things easier but I would be just a happy with extra laugher . WE live paycheck to paycheck, but are very happy! I love my life and I think that if you don't do what makes you happy it isn't worth it! 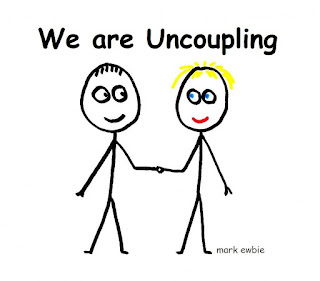 I definitely think uncoupling from emotions or mindsets can be just as real as uncoupling from another person. I have a few mindsets I wouldn't mind uncoupling with LOL. I wish I could uncouple with my short temper and lack of patience. I am constantly a work in progress but some days are definitely harder than others. I agree, my short temper and occasional attitude (bad) could go away. I want to be a happier person, especially around my kids. I'm with you. Letting go of all talk and thought of lack and lost. Great Post. My family is well-off but not by a money standpoint (however I am sure we are well-off to some and poor to others money wise). But I consider us well-off because we are a happy, healthy family. I wish I could uncouple with not feeling like I am good enough to be considered great. Its easy for me to say someone else is great but I have trouble owning my own greatness. The idea that outgrowing a stage in life has never hit me before. It makes so much sense when thinking about it. I would like to uncouple with worry. I worry way too much and it affects my whole life. hi Tracey, It's been so long since we crossed paths! Wow, for awhile I thought your were talking about something different, I am glad your message was so full of inspiration! Awesome post. I like this attitude. I want to uncouple with the idea that I'm not organized. I CAN be organized, and I'm going to do it! I would like to un-couple with my lack of motivation to finish up my honey do list. It weighs on my mind each day, but when it comes to getting stuff done, I always find a way to pass. I would like to uncouple with worrying about peoples perceptions of me. I'm a good and hardworking person and as long as I know that, that's all that matters. I would have to agree with this. I worry way too much about things I have no control over and make things worse than they really are. I agree it's tough sticking a balance with paid vs unpaid posts. I accept guest posts as well to help keep the balance. I say yes to people who want to write for me. It gives me a break and it helps fill in. Sometimes, I will post more than one post in a day. This is a great post because being well off can mean so many things or at least be taken in so many ways. It is quite an interesting thought. Thanks for sharing. 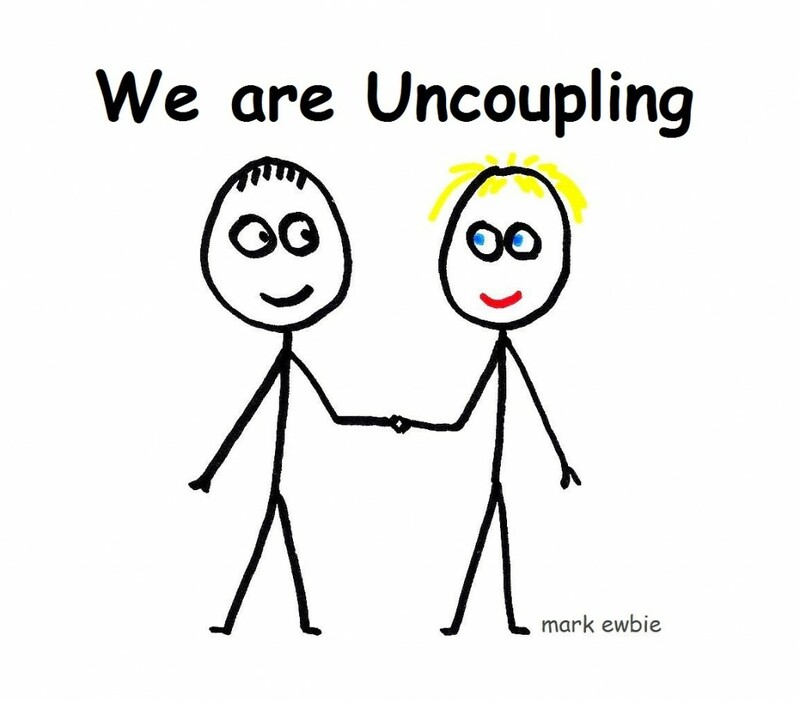 Glad it's not the un-coupling that I am thinking about. Just like you, I would like to uncoupke with some stuff that bothers me so thanks for the inspiration. Well off is such an interesting term to me... looking around what I have compared to many in the world I probably am well off but I would have to compare to third world countries. Comparing to all of them having a roof over my head, a car to drive and clothing... yup well off. But compared to many in our town... nowhere near well off. Perspective I think. I would like to uncouple with stress and fear. I stress way to much about little things like our grocery bill and my fear of tons of things causes a lot of unwanted anxiety. Congratulations on getting back on your journey to self-improvement! Working on yourself is a difficult path to stay on, so it's always good to see someone right the ship! We may not have a lot of money, but we're happy. My husband and I work really hard and I guess that is what's important. I wish i could let go of my anxiety. I have struggled for years with it. I try to be positive but sometimes it just wears me down. I would love to uncouple with the thought that work is a mundane task. I would love to be excited about work everyday instead of dreading it!! I would like to un-couple with unnecessary stress and anxiety in my life. This is something I’ve been struggling with for years. First of all I need to follow you first on the journey on doing more realistic and down to earth blogs vs. blog commericals (thats a good way to put it). I am guilty of doing it more on my platform but you are right a girl gotta eat and my events are also not sponsored either. As I was reading your blog I was at the same time listening to a self-hypnosis on attracting more money into my life....so literally I was uncoupling with the lack of money thoughts and your blog was my confirmation! Thanks for the post! I think it's a great idea to uncouple with the things that are holding you back. I could make a list of the things I'd like to eliminate (thankfully, I'm very content to stay coupled with my list-making). I would like to uncouple with stress and anxiety right now. These two things are causing a lot of mindless eating which = weight gain, which = means more stress on my joints so the chronic pain is worse. We live paycheck to paycheck and most times, its not enough. But, we just keep trying. I made a decision long ago to let go of my anxiety, control it not let it control me. I rarely worry and I know everything works out for me, always. Because? It always does. Eventually and I have peace knowing that. I'm reading this like YES! YES! YES! I need to uncouple with this attitude of lack. I needed to read this. A good friend and I were talking about this only yesterday. I'd love to consciously un-couple with anxiety. It gets the best of me on some days! Interesting perspective in this post. I need to uncouple a few different things in my attitude! Oh yes! I read this and it was like I was nodding in agreement with the whole thing. Thanks so much for posting this!